Chandigarh 30th March, 2019:- Anmol Industries Limited, a leading player in the FMCG of India, one of the fastest growing companies has finally crossed the milestone of 25 year. For the further announcement of expansion plans, new strategies and to discuss about the upcoming investments, Anmol held a Business Partner's meet at Zirakpur. The Honorary Panel & experts, Gobind Ram Choudhary, Managing Director, Aman Choudhary- Director Operations, Rajneesh Sharma GM sales and Marketing shared their experiences and achievements of the company. The fourth largest biscuit brand of the nation spread across PAN India. In the journey of 25 year, Anmol has witnessed various challenges. But this milestone probably stands as the ideal testimony to their success saga. According to Gobind Ram Choudhary, Managing Director that focuses was always to make Anmol emerge as a consumer-driven business and to develop strong goodwill that will resonate among all associated with the company. He shared further that Anmol Industries started in 1994 with just one manufacturing unit and 4-5 products today is just a page in the history of Anmol Industries Limited. It is a leading player in the Indian FMCG industry Product quality and innovation has been the cornerstone for Anmol. Maintained a strong presence across the Northern and Eastern India, now making progressive efforts to establish their footprints in the Southern and Western parts as well. Presently the business is spread across 25 states with 6 state-of-the-art advanced production facilities churning out over 80 different products covering biscuits, cakes and cookies. With a distributor network of over 6000 partners, presence in over 15lacs retail outlets and a team strength of over 5000, Anmol industries Ltd now stands as the 4th largest bakery brand of the nation. For Anmol Industries Ltd. the business philosophy is not just limited to the statistics. The Bengal-based firm is rapidly marking its footprints across various states of India and on the international arena as well only to emerge as a major national as well as a global player in the bakery category. This milestone of 25 year is a chronicle of hard work, perseverance, vision, and values. For team Anmol, the silver jubilee marks the beginning of a new journey. It is an inspiration that will help the establishment target new goals, set foot into newer destinations and touch the lives of millions more. Chandigarh 30th March, 2019:- The 95 years old and President Award winner "Rayman Circus" reaches Chandigarh after almost span of 30 years to entertain the people of Tricity and surrounding areas. The circus will starts from March 31 and will run till 05th May at Manimajra near Housing Board light point. Circus will be inaugurated by Proud of the Nation and Chandigarh Commonwealth Games-2018 Medal winner Anjum Maudgil. The organizer of the circus always presents something new every time and now this time too they are coming up with the artists of Kenya and Manipur. Circus manager Alankeshvar Bhaskar and Sunil Goyal alias Billa said that the people of Chandigarh and surrounding areas are always crazy for the circus. We have always received good response from the peoples of here. Every time we bring something new in the circus, and this time too we brings something different. We hope people would definitely like. This time we specially bring Kenya's artists, who will enthrall the audience with their dance style. Similarly, Manipur's artist will also entertain the audience with their amazing presentation. Sunil Goyal said that apart from these, other artists of circus will also present their own dance and art skills. The two Joker, who are lives of any circus, will also enthrall the audience especially children with their mimicry. Sunil Goyal said that due to the Govt. 's policy of complete ban of the animals in the circus the business has been badly affected. The government is now issuing orders to shut down the circus business. With close closure, all the families attached with the all the Circus, will get affected. He said that instead of giving some relief to this entertaining business that has been running for years, it is intent on closing it altogether. Alankeshvar Bhaskar said that in order to deal with any kind of accident, organizers has made full arrangements to ensure safety, Water tankers, sand bags and fire extinguishers have also been kept to prevent any type of incident. Apart from this, CCTVs also have been installed here. He appealed to the people to come to the maximum number to save this profession and keep it alive. Chandigarh 29th Mar, 2019:- The Punjab Art Initiative (PAI) has announced the opening of its 2ND Edition at VR Punjab. Details of PAI were given at a press conference addressed by PAI's Curator Sumi Gupta, and Bheem Malhotra Chairman, Chandigarh Lalit Kala Akademi. The press meet was also attended by National level artists -Gogi Saroj Pal - a 74-year- old artist who has a number of awards including the National Award of the Lalit Kala Akademi to her credit, Farhad Hussain a recipient of the Nasreen Mohamedi scholarship and Sudip Roy who has his collections as part of Museum of Sacred Art, Belgium, Birla Academy of Art and Culture, Kolkata, Indian Embassy, USA & many more. Part of a successful roster of pan-Indian, award winning art shows that include Dumas Art Project (Est. 2013), Whitefield Art Collective (Est. 2016) and Madras Art Guild (Est. 2019) that are supported by Virtuous Retail as part of its connecting communities© program, PAI will reinforce Punjab's position as one of India's premier art and culture destinations. PAI 2019 is additionally supported by the Yog Foundation. The opening on March 29th included the unveiling of The VR Art Car 2019, a work by artist M. Senathipati, President of Cholamandal Artists' Village, Chennai. 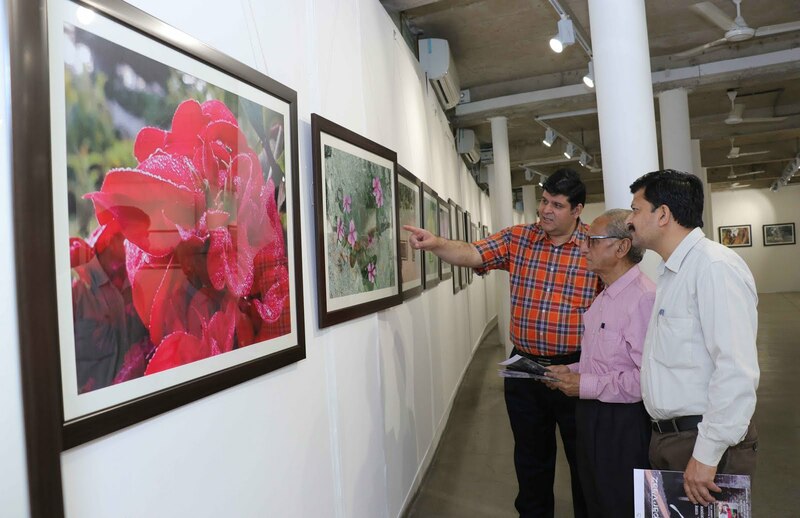 This was followed by an exclusive viewing of works in association with Chandigarh Lalit Kala Akademi, as well as works by Gogi Saroj Pal, Farhad Hussain, Diwan Manna and Manjot Kaur. A highlight of the opening night was a Live Art Performance by renowned artist Sudip Roy. The month-long program that goes on till April 28th, will also have an Art Bazaar in association with Vanity Box, a Baisakhi special - Children's Art Competition, a Baisakhi special food and music Festival Food Tadka showcasing a special installation marking the festival, Punjab in Focus online photography contest along with Art Cinema featuring "Frida", a movie on the life of the artist Frida Kahlo. Speaking about PAI 2019, Sumi Gupta (Curator) said: "Public art has the power to enhance and transform spaces and our broader living environments. The incredible response to PAI is a strong reflection of how we have been able to connect with the local community and bring art into people's everyday life. We are pleased to be back in the Tricity for the second time with our annual showcase. PAI aligns with Virtuous Retail's approach that focuses on creating user friendly city centers both through the art of place-making and through Connecting Communities© through a range of multidisciplinary events and initiatives. Virtuous Retail has been the presenting partner for PAI since its launch in 2017 and a strong supporter of all art forms. Across its many centres in India, Virtuous Retail houses an impressive collection of permanent installations by renowned artists, including the Jal Tapi (VR Surat) by Padma Shri Paresh Maity, Synergy (VR Bengaluru) by Dimpy Menon, Seeds On The Left Bank Of The River (VR Bengaluru) by Murali Cheeroth, The Bodhisattva (VR Chennai) by Satish Gupta amongst many others. VR Punjab hosts Punjab Art Initiative as part of its local Connecting Communities© initiative, an ongoing project that aims to encourage civic pride, strengthen the local economy and enhance Punjab's image. Speaking of PAI and the VR Art initiatives, Pankaj Renjhen, COO, Virtuous Retail South Asia (VRSA) said that we are happy to host Punjab Art Initiative as it dovetails into our philosophy of bringing the most enriching and exclusive experiences to the discerning audience of Chandigarh. This complements the shopping experience we offer with exclusive brands like H&M & Zara amongst others, that makes us the largest and most compelling fashion and F&B destination in the Tricity. VR continues to redefine the spatial retail experience for consumers by adding art and culture to the mix. Chandigarh 29th Mar, 2019:-Programme to collect donation for the support of Armed Forces through participation in mass Signature Campaign which is proposed to be included in the Book of Records. We are an NGO and putting in efforts to support our Armed Forces, through a campaign to collect Funds for effective utilization for their welfare by National Defence Fund authorities. This programme is being conducted with the co-operation of Director of Indian Skill Development Council J.P. Singh, Ex-Senior Banker M K Sharma, President Marwah Studio Sandeep Marwah, Vikram Pratap from Howard University, Major Manish Srivastava and Kabir Sahni From Election Awaaz. Global Organization of People of Indian Origin (Dheeraj Ahuja), and other supporting orgs. We strive to make efforts to create mass opinion towards thanking our Armed Forces member, by highlighting to the general public their plight and needs, a portion of which can be met through contributions through donor like you. Donations to this forum are collected from the masses after their registration for the campaign and a receipt is issued through a counter foil, this will be deposited in the account of National Defence Fund and the particulars of donation would be visible on our website along with the payment details to NDF. The aim is to empower arm forces personnel families by providing them with varied educational and vocational training to make them strong, Enlighten and self-reliant. To promote and spread education of all kinds including education by distance mode, regular mode or education through correspondence mode and online mode of education or any other mode of education in human resource development and disciplines of academics, Professional area or Technology at all levels to interchange views. Chandigarh 29th Mar, 2019:- S Prahalathan, Chief General Manager, EXIM Bank, India, said that Punjab has very good prospects to revive its exports, and be amongst the top 10 exporting States in the country. S Prahalathan said further that besides, agriculture and allied industries, should the latent potential in textiles and automotive industries are captured, Punjab's economy is bound to see a northward movement. Exim Bank apart from financing, facilitating India's trade and investment has also been supporting various States in the country to identify new horizons for exports. In the process the Bank has been conducting state-level Studies to assess the opportunities various Indian States have. Some of these Studies have been done in conjunction with the State Government. Bank is currently undertaking a preliminary Study to identify the export potential of Punjab. Exports from Punjab have registered a negative annual average annual growth of 4.4 percent between 2013-14 and 2017-18. According to the latest figures exports stands at US$ 5.7 billion. S. Prahalathan based on a detailed analysis opines that with an enabling export ecosystem, the State could almost double its exports to US$ 10.3 billion by 2022-23, should it grow in tandem with India's expected export growth. India has set a target to double its merchandise exports by 2024-25. The broad contours of this enabling environment would inter-alia include improvement in institutional and export infrastructure in the State, whilst adopting a focused approach on select sectors. 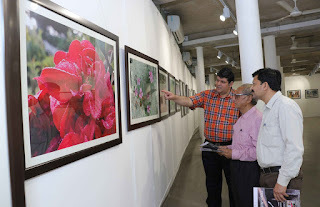 Chandigarh 29th Mar, 2019:- The camera is the constant companion of Ashish Raj, as he walks many meandering paths, trails, undiscovered and unexplored vistas to capture nature's perfection, nature's splendor and myriad forms of beauty -- innocent, spectacular and panoramic. The journey of creativity and a deep connect with photography started about a year back for Ashish Raj on the expansive and landscaped lawns of his beautiful home in Saharanpur, which is an abode of nature. The landscaped lawns are blessed with nature's bounty, birds, flowers, trees, foliage, small animals and Ashish Raj began drawing both solace and peace from such nature, as he observed many moods and moments, sensitively of such nature's views, which were captured by. Ashish Raj on his iPhone camera. The results were stunning, as each frame narrated a story and depicted nuances that are often lost to the eyes. The scenes that Ashish Raj captured on his morning walk Sessions began to unfold so many treasure of nature, which bestowed him experiences made him reflect and view clearly the subtleties of nature's grandness and also took him on a journey of self-discovery and introspection regarding nature. From there on, began a journey that has taken Ashish Raj places, with the internal and external worlds guiding his monochrome and color photographs, as Ashish Raj constantly experiments with the subject of nature, freezing the moments in time, moving beyond the scene and depicting details that were etherealed. Ashish Raj's photographs strive to tell stories of not only nature, but the lives we live, the streets we walk, spaces we inhabit, clouds, birds, landscapes, the colors of the sun, flowers, trees...the frames evoking many emotions and feelings. Prolific in his use of both technique and art, Ashish Raj with 'Parvaz' (first flight of a bird), his first exhibition of photographs, strives to share the stories of these fleeting moments, documenting the natural beauty that surrounds us. The flight of birds, the sky in various hues, the architectural elements of temples, churches and monuments that take us back in time, bare poplar trees in autumn, the sun playing hide and seek behind palm trees, the stark landscape of winter, the rocks in the Kosi river creating natural installations, kinnow-laden trees...the photographs transport you to varied locations, with the colour contrasts and play of light creating works that strike new conversations. Ashish Raj, who is also equipped with a DSLR Camera, doesn't believe in any short-cuts and desists from using Photoshop or color correction, for he believes it takes away the essence and aesthetics of a photograph. Ashish Raj's wife and daughters are his constant supporters and companions, as he embarks on new journeys to pursue his passion of photography in following couplet. 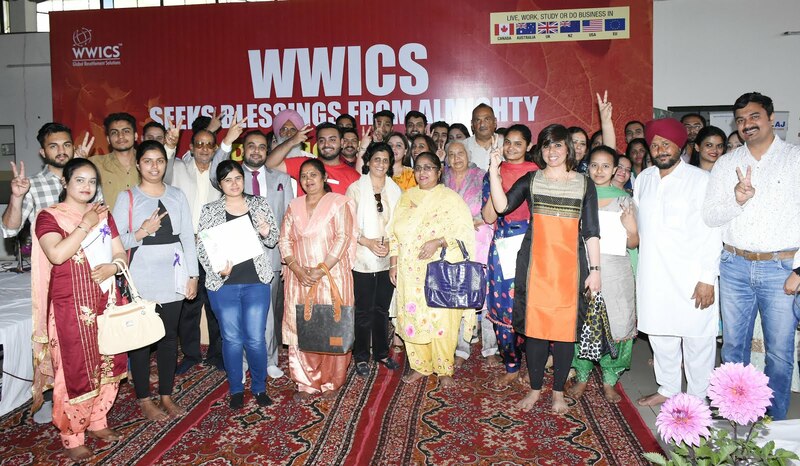 Chandigarh 29th Mar, 2019:- To mark the success of its clients who have received their visas recently under various visa categories, WWICS hosted a pre-departure & Investiture Ceremony at its head office today. Numerous clients, who attended the Investiture Ceremony along with their family members, were handed over visas within a short span of one month. All these clients were immigrating to different countries- Canada, Australia, UK, USA, New Zealand and Europe under Skilled Worker, Business & Study Visa categories. To seek the blessings of the Almighty God, Akhand Path of Sri Guru Granth Sahib Ji was also organized with great devotion and respect. The celebrations started with Bhog of Sri Akhand Path Sahib followed by Gurbani Kirtan and Investiture Ceremony. 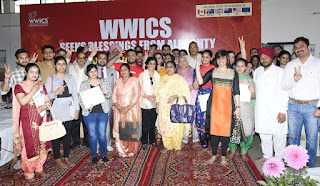 It was a time for jubilance for the applicants and their families who were congratulated by Lt Col (Retd) BS Sandhu, Chairman and Managing Director, WWICS Group and all staff members of WWICS. While addressing the gathering, Lt Col (Retd) BS Sandhu said that since its inception, WWICS has realized the immigration dreams of over 1.5 lakh families who are happily settled in various countries of the world. He congratulate each one of you who has got their visas today and pray to almighty to bless you all a successful and bright future ahead. He further put great emphasis on the need of taking immigration assistance from a genuine and reliable settlement service provider, and asserts that WWICS is committed to provide transparent, feasible, and reliable services to our clients. We believe in building close relationship with our clients by delivering quality services. Not only immigration, WWICS offers complete assistance in settlement of its clients in the country they are moving in through its pre-landing and post-landing services. After they get visas and before they land up on foreign lands, WWICS organizes pre-departure orientation sessions, grooming and training programs to help them prepare for a better tomorrow. Varun Mehra, one of the applicants who received his PR visa for Canada, expressed his joy and credit WWICS for his success. He said that he thank WWICS for helping him get Canadian PR under Express Entry. They have provided him thorough guidance throughout his case and also offered full pre-landing support. He is extremely thankful to WWICS for making the PR journey not only in India but most importantly in Canada a smooth sail. The applicants, who received their study visas for various countries including Canada, Australia, UK, and New Zealand and for various European countries, were also excited for moving to their dream country to get education and were all praises for the services rendered by WWICS. WWICS is one of the world's largest immigration groups with a global presence of over 30 offices located across the various countries including Canada, Australia, Middle-east, Morocco, and Kenya. It is one of the most transparent and trusted Immigration service providers who have helped thousands of thousands clients fulfill their resettlement dreams. 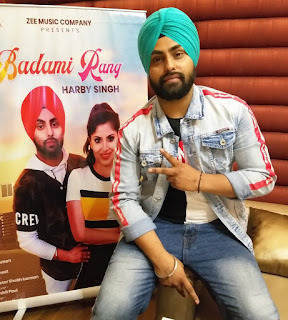 Chandigarh 29th Mar, 2019:- Harby Singh, a budding Punjabi singer, has come up with his new song 'Badami Rang'. The song is a romantic dance number, shot in Bali, Indonesia. It has been released under the Zee Music label. 'Badami Rang' is a Punjabi dance number, which is already getting massive response on youtube and other social media platforms. The song has been produced by Harshit Paul and directed by Shubh Karman. Lyrics are given by Jeet Aman, while the music is given by Jaymeet. Narrating his initial days of struggle, Harby Singh said that his parents did not support him for the first two years. They wanted him to pay attention towards his studies. But he used to skip classes to do his 'riyaaz'. They were unsure if this field could give him a secure future. But when his relatives started praising his singing to his father, one day he asked him how much money will a song shoot cost. That's when his parents finally started believing in him and his singing. So his first song was a result of his parents blessings and support. Harby has been trained in tabla by his father. His inspirations are Sardool Sikandar and Daler Mehndi. His music is in urban style. Harby has already sung two songs before Badami Rang. His first song 'Saun Lagge' was released in 2017. He is also been performing live since 2016 and has done many shows all over the world. From singing as a backup vocalist with other artists to now singing his own songs live, the 26-year old singer is determined to fulfill his big dreams. Chandigarh 28th Mar, 2019:- In last 21 years Rotary from India has sent more than 500 doctors to serve in 43 countries, and majority of them had been from Chandigarh and surrounding areas, informed Rajendra K. Saboo, former world president of Rotary International here today. The concept of intercontinental medical mission was conceived by Rajendra K. Saboo and his wife Usha Saboo with first mission in 1998 to Uganda, which tremendously raised the stature of India in the world as a 'giver' and not a 'receiver' when teams of super specialists shared their expertise and talent with the patients in Africa. A team of 19 doctors from eight specialties along with Rotarian volunteers had recently returned from Madagascar, having attended to 3,500 patients in OPDs. 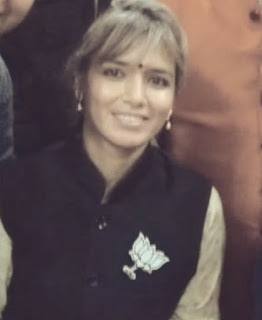 Some of the doctors from Chandigarh included eye surgeon Dr Nivedita Singh, dermatologist Dr Vanita Gupta, plastic surgeon, Dr V D Singh, ENT specialist Dr Raman Abrol, general surgeon Dr. N.S. Sandhu, gynecologist Dr. Nirlep Kaur, and orthopedician Dr. Ravjit Singh. In the most trying situations, 163 eye, 73 general, 36 plastic, 34 ENT, 35 orthopedic, 8 gynecology, and 576 dental surgeries were done. The dermatology department attended to 1250 patients and distributed free medicines to them. Doctors shared their experience of working in difficult situations with dismal infrastructure facilities and lack of trained manpower, causing proliferation of congenital diseases, and many curable but neglected cases of skin diseases, bone infections, broken bones, hernia, goiter, clubfoot, burn injuries, etc. Dr Vanita Gupta said that the country has no trained dermatologist, and skin diseases including fungus, scabies abounded. Eye surgeon Dr. Nivedita found nonfunctional equipment in the operation theatre including auto-clave (sterilizer) and then used pressure cookers to manage the situation. Dr VD Singh added that Indian doctors are most respected for their talent, their ability to work in difficult conditions for long hours and to innovate at the spur of the moment. Praveen Goyal, District Governor 3080, who was a part of the team as a volunteer, said that it moved us to see smiles on the faces of the patient after surgery like the young 8-years old girl who was able to smile because of dental problem. 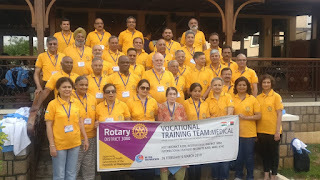 The team of doctors included from India included ophthalmologists, orthopedic surgeons, dentists, maxillofacial surgeons, gynecologists, general surgeons, ENT surgeons, plastic surgeons, pathologists and anesthesiologists, who also trained local doctors in newer medical techniques. R K Saboo said that each medical specialist not only conducted surgery, dispensed medicines, but more importantly, trained the local doctors and paramedics in the latest advances in various medical disciplines. R K Saboo had also initiated medical missions in remote corners of India too in 2006 where similarly teams of doctors travelled to tribal areas and hard-to-reach locations to serve them. So far 14 such medical missions in India have been carried out in different parts of Orissa, Madhya Pradesh, Rajasthan, J&K, Chhatisgarh, and Nagaland. The next international medical mission with team of 17 doctors in going to Mongolia from 5th to 17th May 2019.